Haven't taste tested them yet but how could they not be good? 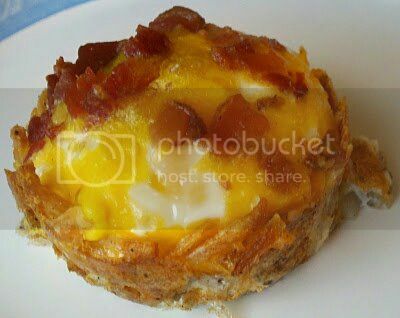 Shredded hash browns pressed into muffin tin; salt and pepper to taste, add shredded cheese, bake in oiled muffin tin for 15 mins at 425. Reduce heat to 350 add egg and bacon pieces and some cheese on top bake 15 to 18 additional mins. That looks scrumptuous!! That would make a convenient breakfast to-go. that looks really really good. No caloric count required. Will def be making this for breakfast soon! This looks wicked good!! Going to try to remember to make it this weekend!